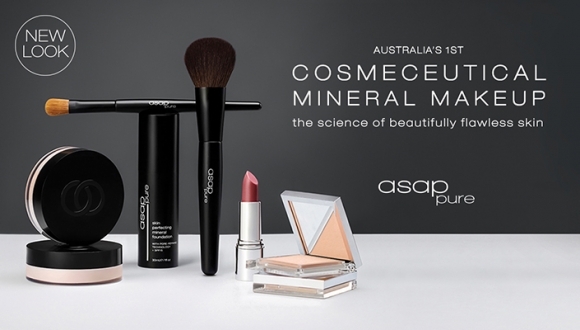 ASAP's commitment to helping clients achieve beautiful, radiant skin led to the development of the 1st Australian cosmeceutical range of mineral makeup, asap pure. An award winning cosmeceutical mineral makeup range that combines the highest quality natural ingredients from the earth, with the latest advances in skincare technology to provide a radiant finish, improved skin health and anti-pollution protection. ASAP works hard to make beautiful skin easy. ASAP pure is a concise, uncomplicated makeup range that is suitable for all skin types. With the inclusion of active ingredients, this truly is the next generation of mineral makeup. Provides a breathable defense barrier against the harmful effects of skin-aging pollution and environmental damage, to maintain skin health and younger looking skin. Antioxidants and SPF protect against free radical damage and UV rays, to help maintain skin firmness and reduce the visible signs of premature ageing. Skin hydrating actives help to improve the appearance of fine lines and dermal dehydration, ensuring optimal moisture balance and barrier protection. Light reflective natural minerals create luminosity and radiance, while clinically proven active ingredients help to perfect skin's appearance, resulting in a natural, flawless finish.